Stuck in a multi-man ladder match at this years WrestleMania, what ever happened to the Intercontinental Championship, eh? In the last five years, there has been twenty-five different Intercontinental Championship reigns, with only six of those reigns lasting longer than three months. Without looking it up, try and guess those six reigns. 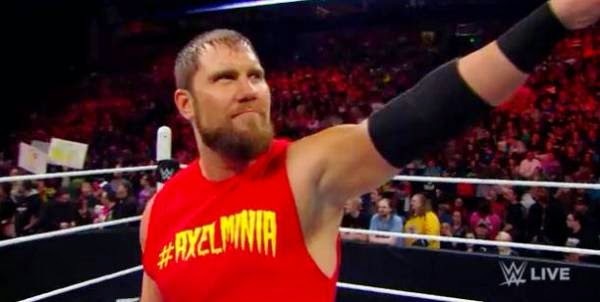 If you had said Drew McIntyre (December 2009-May 2010), Dolph Ziggler (July 2010-January 2011), Cody Rhodes (August 2011-April 2012), Wade Barrett (December 2012- April 2013) Curtis Axel (June-November 2013) and Big E (November 2013-May 2014), you have won yourself a porked pie. Obviously, the length of a title reign isn't everything, but how much do you actually remember from these title reigns? Any feuds that stand out? Drew McIntyre's match with Kane at Elimination Chamber? Ziggler taking on Kofi Kingston Rhodes against Ted DiBiase, Axel battling Kingston all at separate Night of Champions. Big E challenged by Jack Swagger at Elimination Chamber? Barrett didn't even manage a PPV match during his three month run as Champion! Five title runs for Barrett and yet he looks no closer to jumping up the card. It's not even like I'm picking purposefully obscure matches from each Champions run, these are longest bouts each Champion had on PPV, surely they should be memorable for title reigns that took up months of screen time? It's even more telling to look at where each of those six men is currently positioned within WWE. In an ideal world, a lengthy spell holding the Intercontinental strap is a springboard to the World Heavyweight Championship. Drew McIntyre is currently not employed by the company, Dolph Ziggler had short reigns with the World Heavyweight Championship in 2011 and 2013, but has since slipped back into the Intercontinental picture, Cody Rhodes is now Stardust looking to get reclaim the IC title after a year in a team with Goldust, Wade Barrett is now Bad News Barrett, current Intercontinental Champion. Curtis Axel is a job guy and Big E is part of the poorly thought out New Day stable. Remember when you were a Heyman guy, Curtis? The title used to be all about upward movement, positioning a performer for a run higher up the card. The last time a former Intercontinental Champion won his first WWE Championship was CM Punk in July 2011. Jeff Hardy, Randy Orton, Rob Van Dam, Edge, Eddie Guerrero and Chris Jericho have all achieved the same feat since 2000. This used to be the norm, a right of passage if you will. However, I think it's telling that WWE chose to keep Roman Reigns away from the belt before his big title showdown with Brock Lesnar at WrestleMania. Think what having Reigns have a strong run as Intercontinental Champion could have done for the belts prestige when Reigns defeats Lesnar at WrestleMania. Suddenly, the Intercontinental Championship match at WrestleMania is raised in stature. The same principle would apply to Daniel Bryan, The Miz, Alberto Del Rio and Sheamus who all skipped the IC title before winning the big one. Other big name talent that is being heavily pushed at WrestleMania, Seth Rollins, Bray Wyatt and Rusev, similarly negated winning the belt. An IC Title run would have made Reigns look strong. How often have we been told that a wrestler plans to bring "prestige and honour" back to the Intercontinental title? Whilst blatantly pointing out that the company knows it's been mishandling the title for sometime, it's also a case of WWE telling the fans something, but never showing it. One person isn't going to make the belt seem important again, it's going to take the time and effort of a handful of wrestlers and the booking staff to rebuild the belt on a consistent basis, whilst also making it part of the bigger picture. The title needs to stop feeling like an island away from the rest of the company, from where a wrestlers career will never return. It won't be until WWE decides to give those who they have a clear plan of moving up the card long and satisfying runs, filled with exciting matches and gripping feuds, that we'll see the belt begin to feel important again. However, maybe because of how far they've allowed the belt to fall in the eyes of the fans in the last few years, WWE doesn't seem to want to put the title on those earmarked for success in the main event. It's a poisoned chalice that WWE doesn't seem to know what to do with or how to reverse the damage they have caused over the past few years. We may never see the Intercontinental Championship return to it's former glory.